What is the new “Answer similar questions” feature for? Clicking the button for that post took me to this search page listing "similar" questions to answer. I guess that's neat, but those questions aren't really that related, and I'm already following the tags that I'm interested in. Why has this message/feature been added? Perhaps this was added to help new users who don't have favorite tags find other questions to answer. In that case, is this really useful versus teaching them how to follow tags? Should more established users be seeing this message? Test has concluded, nobody should be seeing this particular iteration any more. Crunching some numbers to figure out what worked and what didn't. Regardless, the feature won't be turned on again as it exists (have to add dismissal at the very least, probably much much more). We're running a test around that feature, to see if providing a simple search for "similar questions" helps people find another question to answer. It is uncertain whether that feature will stick around at the moment. 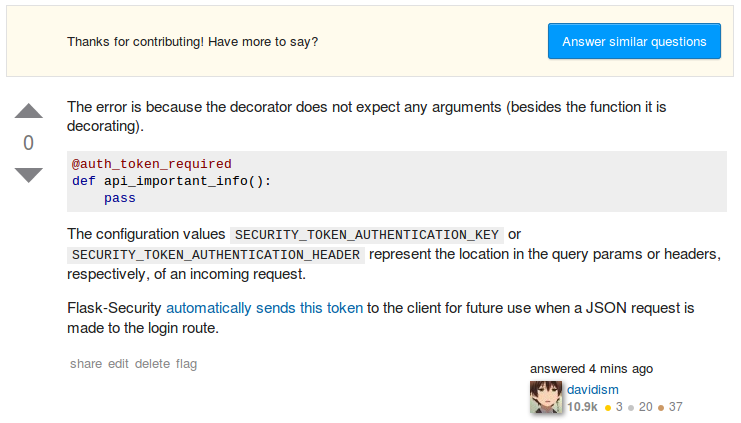 Currently approximately 50% of Stack Overflow answerers will see it. We've been thinking about ways to make it easier for people to find questions to answer. We've been working on making search better, playing around with homepage algorithms, etc. The current test is basically an MVP. The search isn't very sophisticated (though it is technically a little more powerful than what you can do through /search), the copy and UX is only "acceptable," and so on. We'll almost certainly try further refinements, provided the feature proves useful in the first place. We're testing now so we can fail-fast, if this turns out to be a dead end we won't have wasted much time on it. As a "trusted user" who knows how the site works (used to work?) I don't think this banner is very helpful to me, though it might help new users at finding questions to answer. However, I actually want to report a bug with it: The banner should not show if there are no similar questions to answer. In fact, this search ony showed me the very same question that I had just answered (probably due to a caching issue), and now finds no results at all any more. I don't find the feature actually showing me similar questions. Why does the wm_concat not work here? Now, if you see the 10 similar questions, they are no way related to the original question to which I answered. It was related to Oracle's wm_concat function. 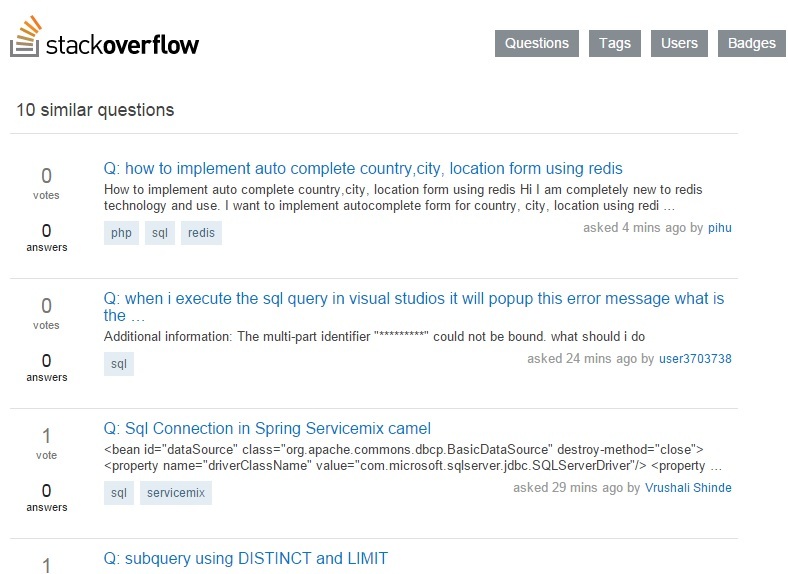 All I see is that the new questions are mostly with the sql tag. 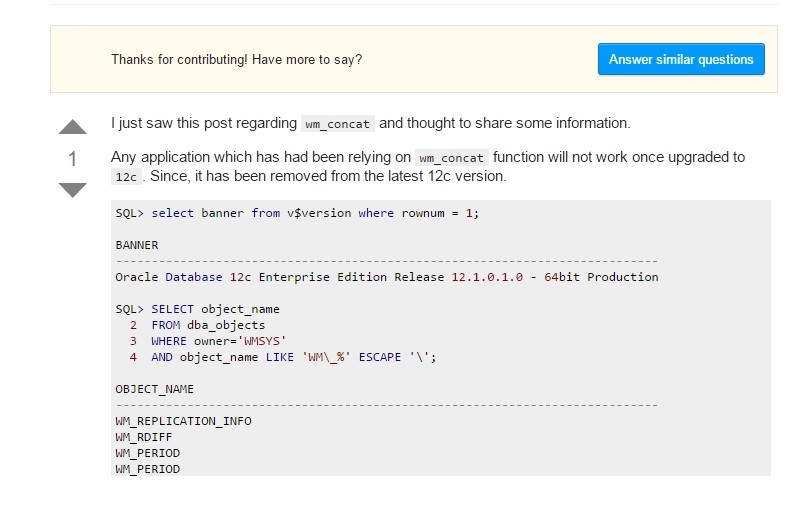 Since the original question didn't have wm_concat tag, I believe the new questions are picked with the other tags, mainly the leading tag sql. Perhaps, the feature needs to be smarter than what it is right now. Else, it is just distracting me. I could find and answer a lot of questions myself, which I do anyway. For me it is yet another annoying feature that I cannot seem to switch off easily. It doesn't give me any questions that are of interest to me. Even if they were, I usually have some scheme to go through all the interesting tags and using this would just mess this up. I just gave an answer that took time to complete and for a reward I get a banner asking for more. It feels the same as if somebody just asked question 2, 3 and 4 after I helped him out with his question. Please let us turn this off ASAP. Don't annoy your answerers or they will move on. At least for the desktop users, here's a greasemonkey script that I use to get rid of the banner. It is a bit hacky but it seemed simpler than trying to directly inject JS into the ajax that generates that box. // @name        Kill Thanks For Contributing Box. // @description Remove annoying Thanks For Contributing box. Not the answer you're looking for? Browse other questions tagged discussion answers search answer-similar-questions . User Option to Turn Off — Thank you for contributing! [Answer Similar Questions]? What should be done with old, useless questions? 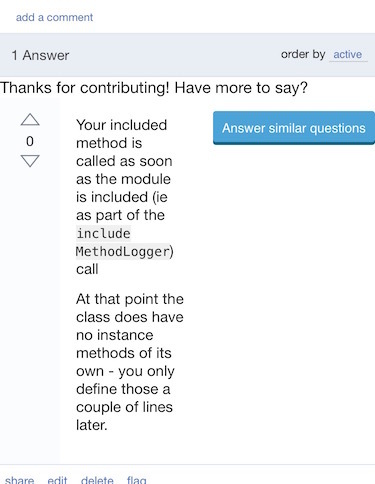 Not a fan of the “Questions” link being highlighted; what purpose does it actually serve again?